Pontos Requerido: 29400 Os jogos não são compatíveis com dispositivos móveis e tablets. Por favor adicione este título à sua Lista de Desejos e inicie a sessão na sua conta the first club desde um computador para concluir o processo de solicitação. NOTICE: Activation key must be used on a valid Steam account, requires internet connection. ABOUT THE GAME	Featuring the cream of the crop from the Paradox stables, the Paradox Grand Strategy Collection features some of our critically lauded and commercial hits. 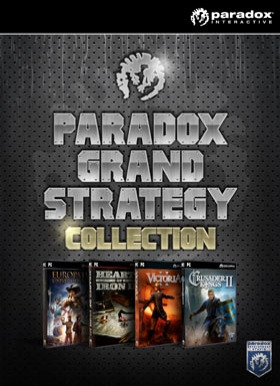 Offering the depth, gameplay freedom and flexibility you’ve come to expect from Paradox, this strategy collection should be the fir… st choice for the gamer who loves their experiences stoic, with high replay value and with unshakeable gravitas. This collection provides incredible value with four celebrated games in one bundle. This collection includes the following games:Crusader Kings II (Windows - Mac - Linux)Europa Universalis IV (Windows - Mac - Linux)Hearts of Iron III (Windows - Mac)Victoria II (Windows)SYSTEM REQUIREMENTS OS: Windows - Windows 8 Linux Mac OSX View the individual games for details about system requirements.